The Information Day was held on 1 December 2012 (Saturday) at the HSMC campus. Information seminars and booths introducing 5 Bachelor Degree and one Associate Degree Programmes were organized for potential students, parents and teachers. The information day has attracted over a thousand students and parents on campus to inquire about our programmes and many of them had submitted their application forms. All the programmes have their own information seminars. Expect for the BBA (Hons) and AD degree programmes, applicants can choose to take a written test. Those who performed well are invited for an interview and could be given a “conditional offer”. 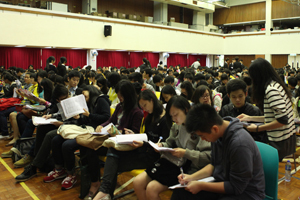 Students attended seminars at the School Hall. 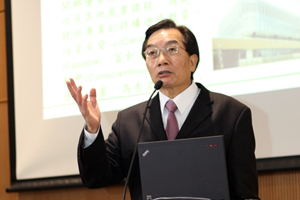 President Dr Chui Hong Sheung introduced HSMC Campus to the visitors.